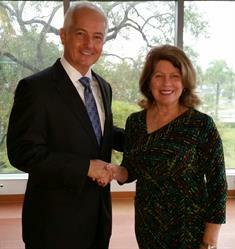 FORT LAUDERDALE, FL--(Marketwired - February 16, 2016) - Kim L. Cavendish, Museum of Discovery and Science President/CEO, announced today that JM Family Enterprises has made a $250,000 donation to the final phase of the Museum's $33 million capital campaign, bringing their total campaign support to $2,250,000. The campaign has already funded the EcoDiscovery Center wing that opened in 2011, more than doubling the Museum's exhibit space. Kim L. Cavendish said, "We deeply appreciate JM Family Enterprises long term and continued support and we look forward to making the Museum an even more exciting and valuable resource for our community." Renovation of the AutoNation IMAX 3D Theater, adding digital and laser projection systems. As the Museum experience is extended outdoors with the addition of the Science Park, visitors will enjoy engaging opportunities to learn about basic principles of physics and engineering in a high-energy atmosphere. With the needed renovations and expansion, the Museum will continue to be a relevant and vital resource to supplement science education and help build a stronger workforce in South Florida for generations to come. "The enhancements planned for the Museum of Discovery and Science will provide new and engaging ways for children to learn and explore their interests," said Colin Brown, President and CEO of JM Family Enterprises. "The museum is a valuable part of our community, and we look forward to seeing many more young people experience all it has to offer." The final phase of the Capital Campaign is well underway. Other major campaign donors include AutoNation, City Furniture, Broward County, the State of Florida, and Rose Miniaci. The Museum staff and Board of Trustees are committed to enhancing the pipeline of today's youth toward STEM knowledge and careers. The Science Park is a key element in this vision and we must maintain the current facility at a high level for our more than 400,000 visitors annually. JM Family Enterprises, Inc., founded by Jim Moran in 1968, is a $13.1 billion diversified automotive company ranked No. 34 by FORTUNE® as one of the 100 Best Companies to Work For®, its 17th consecutive year on the list. JM Family has approximately 4,100 associates and its primary subsidiaries include: Southeast Toyota Distributors, the world's largest independent distributor of Toyota and Scion vehicles; JM&A Group, one of the leading independent providers of finance and insurance products in the automotive industry; World Omni Financial Corp., a diversified financial services company; JM Lexus, the largest volume Lexus dealership in the world; and JM Service Center LLC, the company's internal shared services center. Headquartered in Deerfield Beach, Fla., JM Family has major U.S. operations in Jacksonville and Margate, Fla.; Commerce and Alpharetta, Ga.; Mobile, Ala.; and St. Louis, Mo. The AutoNation® IMAX Theater, owned and operated by the Museum of Discovery and Science, opened in 1992. The 300 seat theater is a showcase of state-of-the-art motion picture technology. In September 2014, the theater underwent an extensive renovation including a new giant screen (60 ft. x 80 ft.), new luxury seats, new powerful sound system and the addition of a digital projection system to complement our 15/70 film projector. The dual IMAX projection system allows for both digital and 15/70 IMAX films to be shown, offering a more consistent flow of new Hollywood films in addition to our classic documentaries. The IMAX Experience® is an unparalleled fusion of sight and sound. Audiences will enjoy six-story high images of unsurpassed brilliance and clarity as they're immersed in 32,000 watts of digital surround sound broadcast through 56 speakers. And the special geometry of the theater makes you feel as though you're immersed in the action. You're just not seeing the movie --- you're part of it. Both 2D and 3D films are shown in the theater and 3D films are viewed using special IMAX® 3D glasses. The AutoNation® IMAX 3D Theater is home to the BIGGEST screen in South Florida and is one of only three Certified Giant Screen® theaters in Florida as certified by the Giant Screen Cinema Association. For show times, call 954.463.IMAX (4629) or visit www.mods.org.